After an influential trip to Peru seven years ago, chef Erik Ramirez — whose previous stint was as sous chef at Eleven Madison Park — made a decisive shift to focus his attention producing top quality Peruvian food. This dedication, further fuelled by his family heritage (Ramirez’s parents immigrated to the US from Peru just before he was born), is what sparked the premise for Llama Inn. 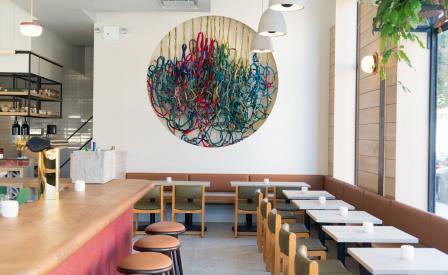 The 65-seat restaurant occupies a light-filled corner building in Williamsburg’s north side, in a once sleepy part of the neighbourhood that is now, thanks to a flurry or new residential buildings, quickly being invigorated with dining and retail establishments. Even in this competitive area, Llama Inn stands out. Everything from the menu to the super-friendly wait staff could be described as vibrant. As is the décor by local outfit, JFD Studio, which includes overhead shelving packed with tropical plants and decorative textiles by local artist Betil Dagdelen that were commissionee for the space and handmade using traditional Andean weaving and knotting techniques. With inventive, flavour-packed dishes such as quinoa with banana, avocado and bacon or red snapper tiradito with persimmon, yuzu and ginger, along with an inviting, unstuffy atmosphere — intended to feel like a corner barrio bar - it’s not surprising that this spot is packed every night. If you can, get a seat at the chef’s counter, so you can see the kitchen in action and plot out the dishes you’re going to order over a Llama Del Rey (a not-too-sweet sangria-like cocktail made with pisco that’s available on draft). Or, when the weather warms, head upstairs to the restaurant’s newest addition: a rooftop lounge.